1.5 Gal. 4 per case. Must be used in a ProLoc wall mounted system. General Disinfection: Add 1 ounce of this product to one gallon of water. Treated surfaces must remain wet for 10 minutes. At this level, this product is bactericidal according to the AOAC Use Dilution Test method on hard nonporous surfaces modified in the presence of 5% organic serum. Canine Parvo Virus Disinfection: Add 4 ounces of this product to one gallon of water. Treated surfaces must remain wet for 10 minutes. At this level, this product is bactericidal according to the AOAC Use Dilution Test method on hard nonporous surfaces modified in the presence of 5% organic serum. Virucidal Performance: This product is effective against the targeted viruses at 1 to 1.25 ounces per gallon of water or equivalent dilution. CONCENTRATED MULTI-SPECIES DISINFECTANT,CLEANER & DEODORIZER Many of the animal specialty disinfectants on the market today require a second pre-clean solution before the disinfectant can be applied. This increases both product and labor costs! 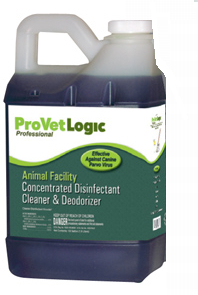 ♦ Animal Facility Disinfectant is formulated to effectively break down biofilm to ensure complete product efficacy. ♦ Animal Facility Disinfectant provides over 30 animal specific efficacy claims including Canine Parvovirus, Kennel Cough, Feline Calicivirus and Feline Distemper, as well as MRSA, Ringworm, Salmonella, Avian Influenza and more! Product Benefits Broad spectrum of kill claims for: Canine, Feline, Avian, Farm & Zoological Concentrated formula: General Disinfection: 1.25 oz. per gallon Canine Parvovirus: 4 oz. per gallon Does not require a pre-clean solution. Eliminates the need for bleach.